To truly appreciate how great this building is, let us start with the story of how it came to be. Exactly 100 years ago, the National Memorial Association was founded, starting a serious debate about the possibility of some kind of monument or museum to African-American history in the United States. The project received funding in 1929 from President Calvin Coolidge but fell through in 1933. Efforts continued, and from 1988 to 2003, Georgia congressman John Lewis introduced a bill every single year that would have finalized the plans for such a museum. President George W. Bush gave the final go-ahead in 2005, and in 2009, the winning team was announced. That team consisted of a trio of black architects. J. Max Bond—of Davis Brody Bond and the namesake of the J. Max Bond Center on Design for the Just City at City College of New York’s Spitzer School of Architecture—joined Phil Freelon and David Adjaye in collaboration with the Smith Group. The collective calls itself FAB/S, and they beat out a high-profile group of competitors, among them Diller Scofidio + Renfro, Foster + Partners, and Moshe Safdie, all heavy hitters in the cultural building sector. The making of the museum, which is the newest building on the National Mall—the country’s public commons—was an expectedly daunting process of building consensus. Who decides on a building that represents an entire group of people? According to Lonnie G. Bunch III, founding director of NMAAHC, there were many opinions. “The building must be monumental and marble; it must be boldly black; it must look African; it must not look African. In every case, they said, it must not obstruct the public’s view of surrounding monuments,” he said in his introduction to Mabel O. Wilson’s book, Begin with the Past, which tells the story of the museum in detail. The result is an object-building that at first seems like an out-of-place, estranged box that confronts and withdraws simultaneously its surroundings. However, it is exactly the opposite of that as an urban experience. What makes this building so great is that this backstory—while intensely interesting—really only sets the stage for the building to enact one of the greatest American history stories on one of the most important sites in the country. The large, brown building stands four stories above grade, with the Washington monument in the near distance. While most of the other buildings and memorials on the mall are white, what does it mean to be a brown building that recognizes the contributions of a non-white group? And what does it mean that it is also the closest building to the Washington Monument, a white marble obelisk to a single man who was the slave-owning first president of our country? 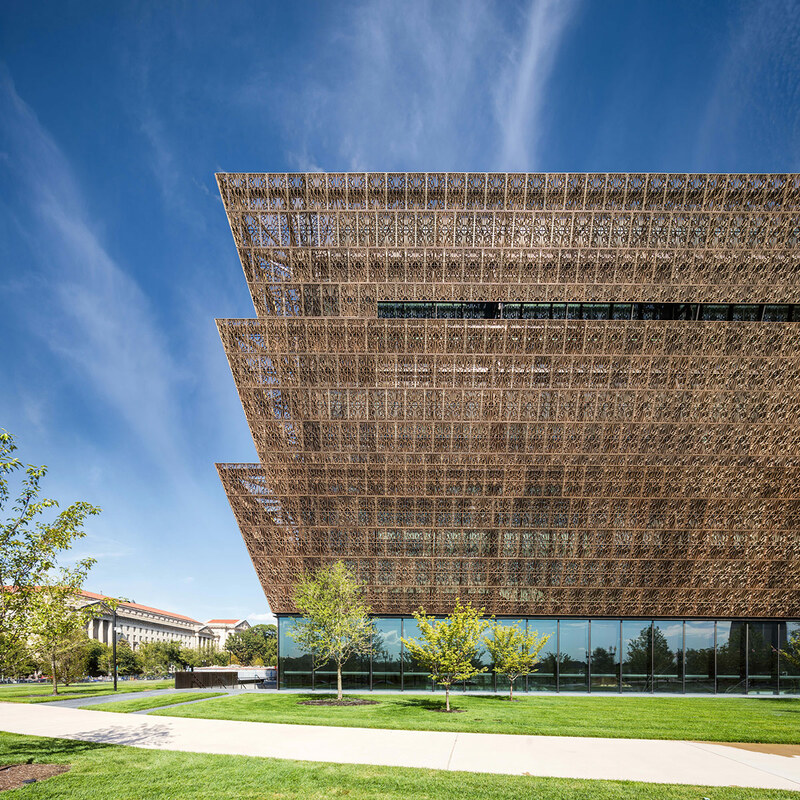 Now that this building has taken its place on the mall, and thus American history, it cements the story of African American struggle as a part of the American story, which in itself is a great step of progress for both African Americans and the nation in general. One of the ironies of its site is that George Washington actually gave some of his land to former slaves, most notably at Gum Springs, Virginia, where some of his former slaves formed a community. So perhaps he wouldn’t have minded this situation almost 250 years later. Of course, some figures from history would be appalled. But this museum isn’t about a confrontation of people, it is about collectivity, sharing, and inclusion. On the south side of the building, facing the mall, this attitude of inclusion and coming together manifests in the building’s formal site strategy. A covered outdoor space is a scaled-up version of the vernacular American covered porch, which represents a black space that has historically been used by the African diaspora as a place for sharing, socializing, telling stories, and giving lessons. 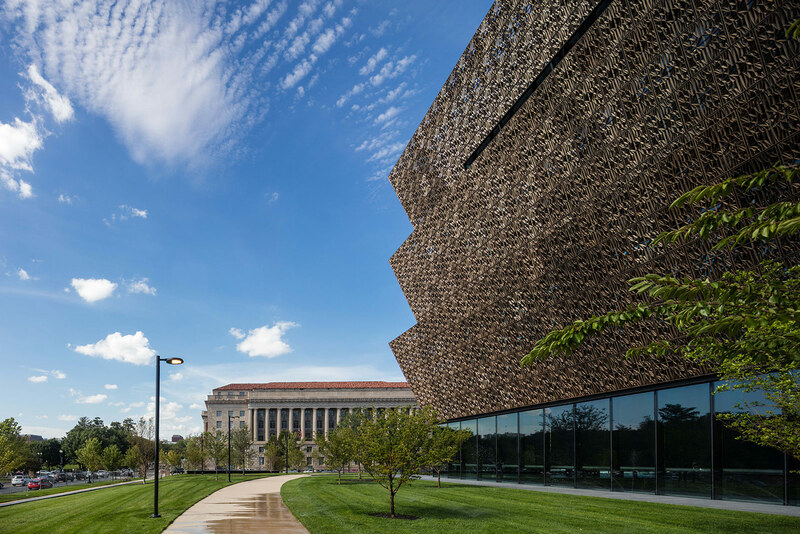 Here, it acts as a mediating threshold between the normative history of America as told through the national mall, and the new story that is being anchored with the NMAAHC. It is meant to be a welcoming place for visitors of all backgrounds to share in this incredible story. This means that the entrance on the ground floor is completely open to the Mall, giving visitors spectacular views and creating a welcoming transparent and continuous space that represents openness and inclusion—foundations of a collective future that the museum might allow us to envision. The overhang is also a shading device, a formal nod to vernacular passive strategies. The overall form of the museum’s exterior is what the designers call a “corona”—inspired by a sculpture by Nigerian artist Olowe of Ise that shows a crown with similarly angled masses. The shape also references a group of people with their arms raised in celebration, as if to telegraph the one hundred year triumph that is exalted so proudly in the galleries within. It announces the arrival of African American history in the official Smithsonian. The angle of its tilted facade matches the top of the Washington monument. It is meant to fit in with its surroundings, not confront them. The iconic profile should serve as a marker for those looking for the museum, and it certainly sets the new structure apart from its neighbors in the vicinity, both in color and ornament. The ornament is an important and complex part of the narrative of the building. 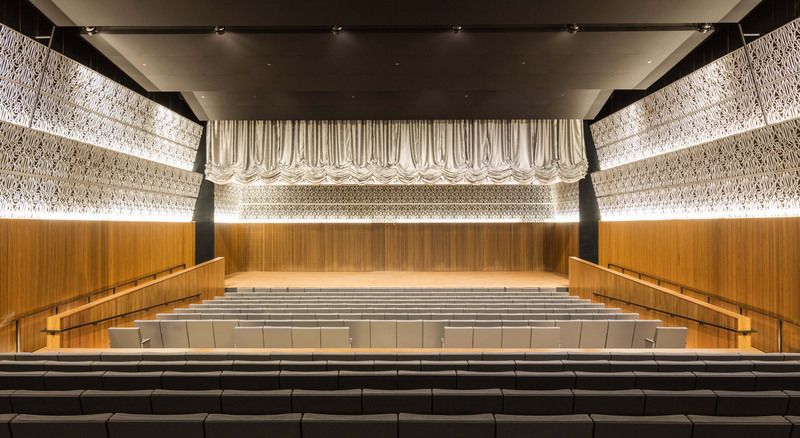 Adjaye produced a single patterned cast-aluminum panel that is tessellated to create the iconic, translucent facade. The pattern was abstracted from cast-iron work produced by black workers in Charleston and New Orleans. Adjaye mapped out the welded connections, literally the points where the work was done. There is some artistic license here, and the pattern comes off as somewhat arbitrary, but the story remains. This particularly American form of modernity is a perfect glimpse into the unique history of the American South, but also the contributions that African Americans have made to the country—many of which have gone underreported due to institutional racism. The bronze facade reflects the patterns and creativity that enslaved people brought to the ironwork of Charleston and New Orleans, and thus to American history itself. Which brings us to the galleries. Of course, a building cannot serve only as a metaphor, it must also serve a purpose. In this case, this purpose is to function as a museum that has all of the same goals as the building itself. The 100,000 square feet of exhibition space is home to items selected from roughly 40,000 artifacts assembled over a decade. 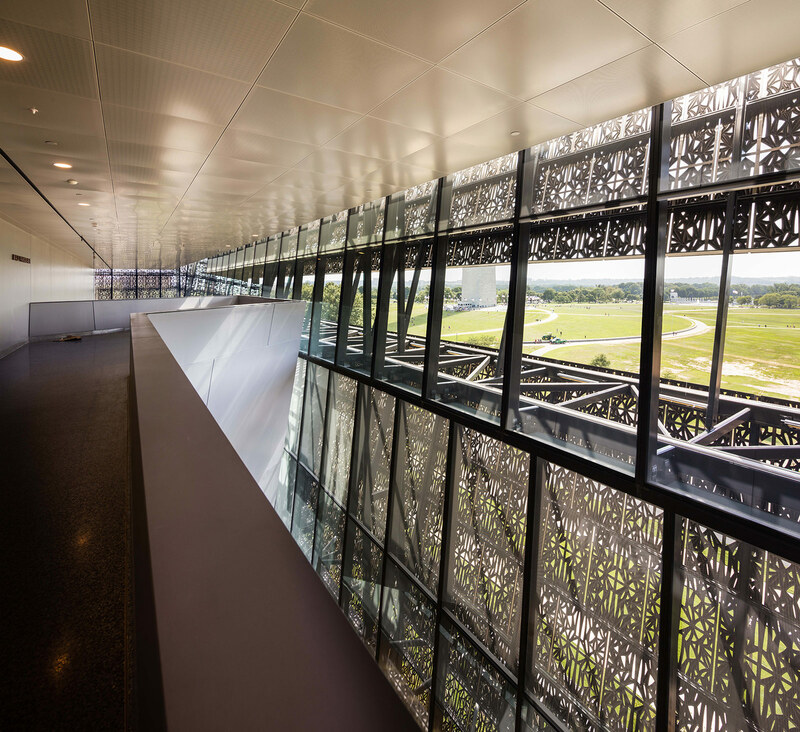 It is fitting that this building’s facade and programs, such as education center, theater facility, and public spaces, represent a collective celebration of African American history and a new space dedicated to it. The galleries extend the metaphors into physical, phenomenological architectural experience. To experience the choreographed architecture of the galleries designed by Davis Brody Bond, visitors start by descending 65 feet below ground in an elevator. Deep underground, the exhibition starts with an overview of the earliest days of the slave trade, in a global seafaring economy. Diagrams of how to pack the most humans in a slave ship are just a few of the haunting artifacts displayed here, where a low ceiling and dark walls recreate the feeling of being in the hull of a boat, with nowhere to go. Working through the timeline of American history, the galleries provide a sensory spatial experience that works in harmony with the content. Much like the museum is a chorus of many people distilled into one building, the curators sought to tell larger stories through single artifacts or single people who could collectively encompass larger narratives. The year 1776 is shown—rather shockingly—with Thomas Jefferson standing on a plinth as if to suggest that he is at a slave auction. A pile of bricks is next to him, each one representing one of his slaves. The museum’s narrative is surprisingly self-reflexive. It is not confrontational with any group of people, but it certainly sheds light on some of the darker parts of a normally whitewashed past. In this moment of freedom, the path opens up to an open, massive four-story space. The story of Jefferson’s slaves problematizes the notion that 1776 was the birth of a free nation. Because freedom from Britain did not mean freedom in any literal sense for all African Americans, it is back into the constricted hallways of history, as visitors work through the antebellum era, with slave memorabilia and Civil War artifacts that include a slave cabin as well as a tent from one of the “contraband camps” of freed slaves who were put up by the government during the Civil War. These proto-refugee camps were dotted all over the south, as many freed slaves worked for the Union Army. Once again, upon the completion of the Civil War, we re-enter the large open space but are immediately back in the dark, constricted space of the pre-civil rights era. This is probably the most poignant part of the museum, where architectural artifacts are brought in at full scale, including a guard tower from Louisiana State Penitentiary that was previously a plantation—an unapologetic reference to contemporary mass incarceration. There is also a segregated rail car, as well as the best part of the whole museum: The actual Greensboro lunch counter where students staged protests against segregation. The museum has rebuilt it, but integrated interactive screens to educate people who can sit at the counter and learn. The final stretch, after the murals and “Whites Only” signs, is the popular culture of the 80s and 90s, followed by the ultimate (symbolic) triumph: the inauguration of President Obama. Walking up the ramp toward this moment is the perfect metaphor for struggle and overcoming. Of course, there is still much work to do, and a screen right next to the image of the 2009 inauguration shows clips of people addressing issues of white privilege and unequally distributed, state-sponsored violence. It will be interesting to see how the museum evolves along with its content, as the two are in constant dialogue. In another perfect metaphor made real in a spatial experience, the above-ground galleries are filled with a celebration of black culture, from sports and entertainment to the contributions of African Americans in society, from science to the military. The circulation spaces in this museum are not very good. They have the feeling of an airport, and the main lobby is sloppily organized and too big. But that is not really the point. The galleries work really well as a narrative, and the symbolic content of the facade and overall form of the building work so well in the context of the National Mall that we can easily forgive some of the shortcomings. Most importantly, the National Museum of African American history transcends its value as a museum and casts a narrative of inclusion, as one of the most important yet marginalized and unrecognized groups of people takes a bold new position in the image of society, partly through architecture that has been carefully calibrated to do just that. 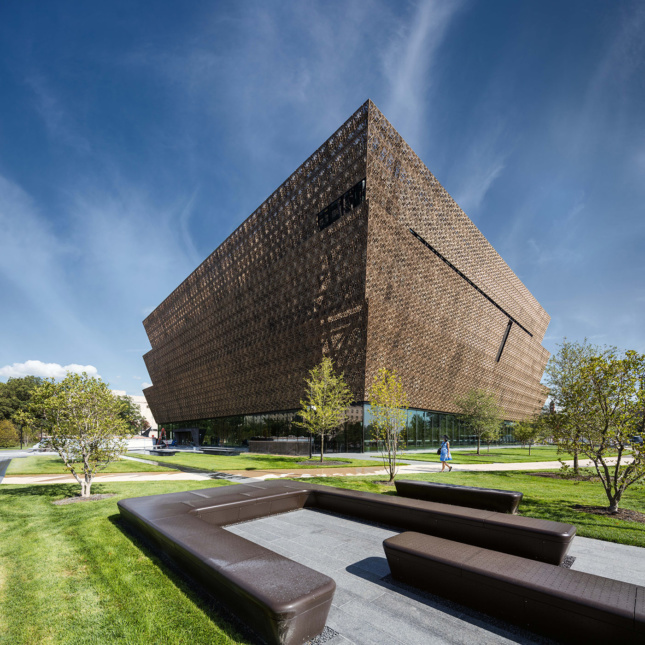 David Adjaye Davis Brody Bond Washington, D.C.